Nearly 100 years ago, residents of Currituck County rallied to build a school for the underserved African-American population. Recently, residents of the same community chose to save the dilapidated structure from destruction. Chris Thomas reports. How do you make the best out of a bad situation? “Man, let me tell ya, you want to talk about remarkable engineering and some really, really, fascinating things to see." Paul Robinson, owner of Currituck BBQ Company in Barco – one of the county’s many unincorporated communities. The building now rests behind his restaurant. Robinson is originally from Montgomery County, Maryland, but his mother hails from Currituck County. He said the Outer Banks played a major role in his upbringing. In his commute to work each day, he passed an old, abandoned building with a weathered façade. Its story was unknown or forgotten to many, but remembered by some. In 2002, the National Trust listed Rosenwald Schools among the 11 most endangered historic buildings in the country. The Coinjock Colored School is one of nearly 5,000 built across the south and Midwest between the late 1910s and early 1930s. They were funded, in part, by Julius Rosenwald, who helped turn Sears, Roebuck, and Company, into the titan it became. Among the states served by Rosenwald Schools, North Carolina was the most active. According to the State Historic Preservation Office, more than 800 were built in North Carolina – many of which were in eastern counties, including Duplin, Edgecombe, Pitt, and Currituck. Barbara Snowden is president of the Currituck County Historical Society. She first became interested in 2011 after she became aware the school was in danger of destruction. As Sears’, and Rosenwald’s, stock rose, the fortunes of black Americans plummeted, especially in the rural south. According to History South – a website founded by Charlotte based Historian Tom Hanchett – the government spent about $5 less on average for black students than white students in 1915. With the help of public education and racial justice advocates, including Tuskegee Institute Founder Booker T. Washington, Rosenwald started a fund to help address the education deficit among black children in some of the country’s poorest areas. But as Snowden explains, these projects were a joint venture between the philanthropist and the communities. Between 1920 and 1950, the building – with its wooden exterior, asphalt roof, and two classrooms – not only served as a school house, but as a meeting place for the Coinjock community. But by the end of World War II, black schools in Currituck County – including Coinjock’s – were in dreadful condition. The county built a new school for all black students and soon after that, the former Coinjock Colored School was sold and turned into a private residence. As time passed, the building became dilapidated and a public eyesore. There were plans to demolish it. This didn’t sit well with Snowden. Originally, according to the State Historic Preservation Office’s reports it only took about $4,000 to build the school, which opened in the autumn of 1920. Nearly 100 years later, Robinson bought the property for only $1,000 more – though that came after a bit of negotiation with the previous owners. So, what’s next for the old school house? Robinson says it will, in part, pay tribute to its past – as a museum and a meeting place for the community. He also hopes to convert it into a country store. Robinson said he isn’t completely sure how much the project will cost, but he hopes to have it open in the next two to three years with the school’s original floor plan in place. The building is an example of North Carolina’s mixed history on race and education. Though segregation remained the law of the state for another 40 years, it took contributions from white residents and the Currituck County government, along with the local, black community, to make the school a reality. 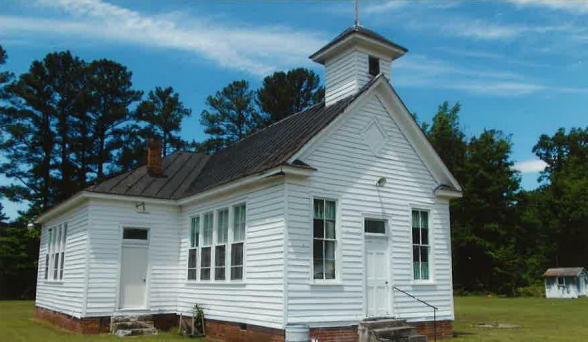 The Coinjock Colored School, and the remaining Rosenwald Schools across North Carolina, are tangible reminders of a state that straddled the fence between keeping the races separate, and often unequal, while taking relatively proactive measure to make sure all its citizens had access to an education. If you want to find out more about North Carolina’s Rosenwald Schools, visit the State Historic Preservation Office’s website at hpo.ncdcr.gov.